Lily's Little Learners: Fugglers Review - Adopt at your own Risk! Fugglers Review - Adopt at your own Risk! So now I am hearing you say, What on earth is a Fuggler?? Lets see, they are a little tricky to describe. They are cute, and cuddly, but dare I say they bite? 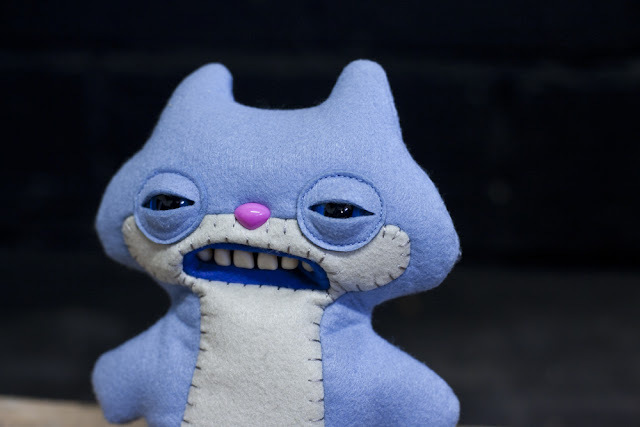 Fuggler stands for Funny, Ugly Monster. They are made by Spin Master and they are all looking to be adopted into horrible forever homes! They are aimed at children 4+ and as I still concider myself a big child, they are perfect for me. I knew I had space in my home to adopt a couple so Spin Master happily (and I mean happily, as they needed rid of these chaotic monsters) sent me two to review. Fugglers (unhappily) arrive in a cardboard box. As you can see from their faces they disapproved at being shoved into a cardboard box and so there is a warning label on the front which says Do Not Shake Box, and also Adopt At Your Own Risk. I am quite a risky person so I must say that I was quite happy to adopt these cute little monsters and so opened the box to let my Fugglers out. They even came with a certificate of adoption which pleased me to know that they were mine. 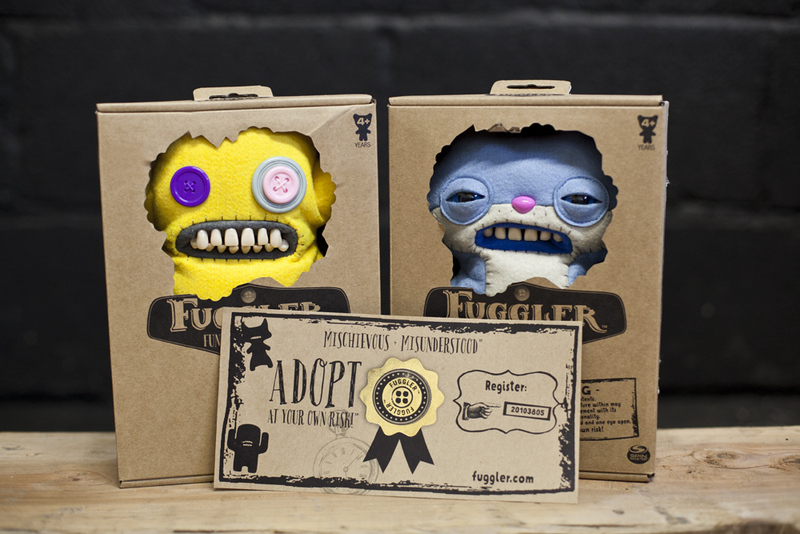 You can also head to the website to register your Fuggler for official adoption. So my first impression of a Fuggler. First I had to try and keep him still to grab a good look at him, he was definetly excited to be out of the box and was twitching all over the place to be let loose. 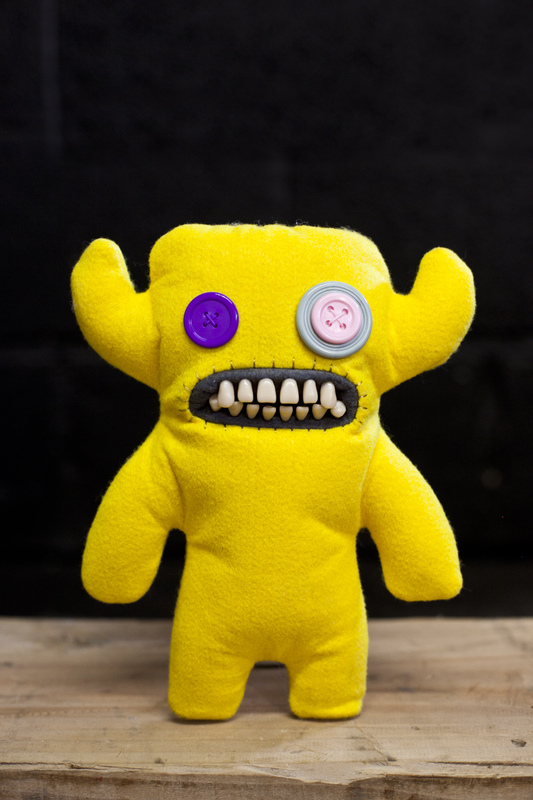 The first little one that I let out was yellow, he had big button eyes and horns. The thing you notice about him the most is his enormous teeth. It was a risky move as I could of gotten bitten but I decided to have a good feel of those peggies and wow they feel like real human teeth. I must admit I am super impressed with them and they really do help give the Fuggler that Fugly look! The second little one I let out the box was a little less toothy but still had some of those like life teeth in its mouth. But the thing I loved the most about this one was its eyes. There vacant squinty glass eyes make them look so real and so freaky. Though of corse I mean freaky in a good way! 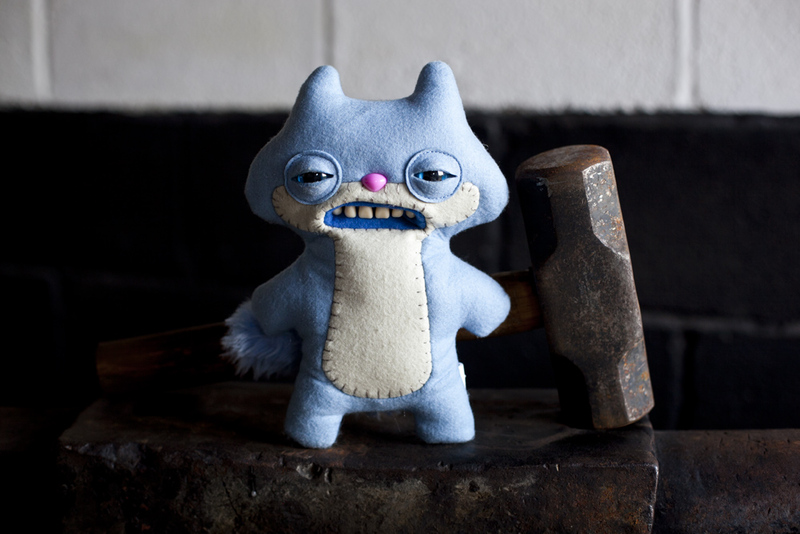 This little blue one also has a cute bushy tale which makes you want to give it a cuddle. But just be careful because catch it in the wrong mood and cuddling it may be the last thing your hands do! One thing fugglers like to do is get out and about. Leave them in your home for to long and they will just trash the place! So just like when you have a pet dog and need to take it for walks, you need to take Fugglers for little outings so they can run free and cause some mischief. So I decided to take these out for a little trip to my friends work place. Im not 100% sure if this was a good idea or a bad idea yet as my friend is a blacksmith and has all sorts of dangerous tools around and before I knew it they were playing with hammers and having fun with flames! It wasn't long before I got them back into the box before they decided to try burn down my friends unit. But don't get me wrong, as much as these guys cause havoc. I am so happy to have adopted myself some Fugglers and I have fallen in love with them. In fact I love them so much that since Spin Master sending me these 2 monsters, I have adopted myself a third. I can see myself having a house full of them. Also Lily was super happy to have them join the family and has been happily making them pretend cups of tea and giving them cuddles. They are actually very child friendly. So if you are looking to raise something a different then Fugglers may just be the thing for you. To be able to find your perfect Fuggler, head to the Fuggler Website and have a look at who you could adopt. What do you think to Fugglers? Would you like to adopt one? Well, a new word for me, too. I don't know what to make of them but, yes, I would give adoption a try. Oh they are kind of cute in a way! I would adopt one! Maybe. Though Adoption Week (was officially last week, aimed at increasing awareness, etc). Blue one shown above :- Looks sleepy. Heavy eyelids make it appear exhausted / sleepy. Adopt at your own Risk! I suppose for some that can be a reality :- As adoption is for life ( Parental Responsibility till child legally reaches adulthood). I'd like to know about Animal / Pet Adoption. I actually think they are kind of cute, in a weird way.